A Gold iPhone 8 is lying on a grey paperboard. The iPhone is placed in the center-left. In the upper right corner, there is a small grouping of light purple and white flowers with a light yellow center, they look like hydrangea flowers. 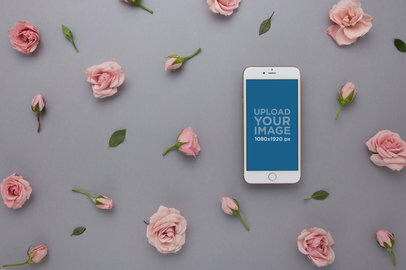 Both the iPhone and the flowers are sitting on a solid violet background. On the right side of the picture, there is a gray cardboard sheet angled diagonally. On the grey paper, there is a Space Gray iPhone 8. 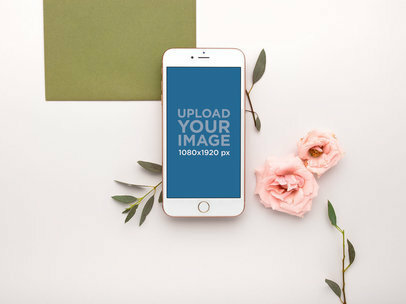 There are minimal green leaves and white petaled flowers with yellow centers surrounding the iPhone. A Space Gray iPhone 8 is lying on a sheet. 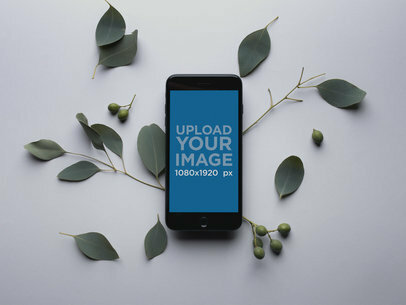 The iPhone has a blue background and is surrounded by thin dry green leaves. The iPhone 8 Plus is surrounded by flowers laced in gold and rose. The phone has a white facing in the front and gold on the sides. It's laying on an envelope that is turquoise in appearance set against a manila piece of paper to accentuate the gold. A woman with brown hair and a colorful sweater stands in front of a purple background. She is holding a Space Gray iPhone 8 Plus in her right hand in front of her face covering her mouth. 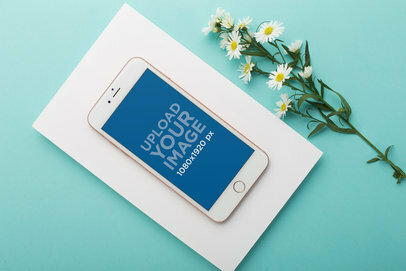 A black iPhone 8 is sitting on top of a white piece of paper. The piece of paper is sitting on top of some light green and brown olive branches. The olive branches, paper, and phone are all sitting on a cream colored table. A Space Gray iPhone 8 rests on a cream-colored cardboard display. The device is flanked at the corners of the image by two broad green leaves. 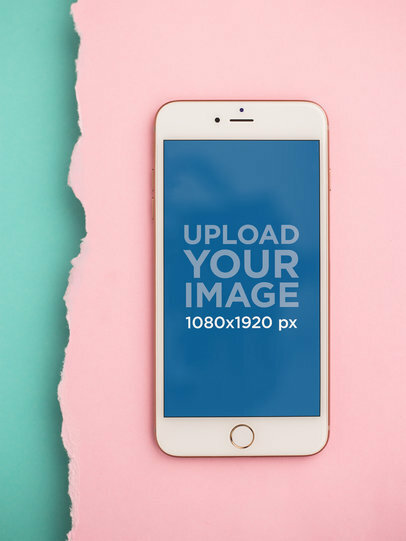 The display of the iPhone itself indicates that an image can be uploaded in its place and it specifies a pixel resolution of 1080 by 1920. A young woman is wearing a thick, brightly colored striped sweater. She is holding a silver iPhone 8 in her hands. She has short brown hair. The background is red. Daisies are spread evenly on a light pink background. The daisies have white petals and a yellow center. 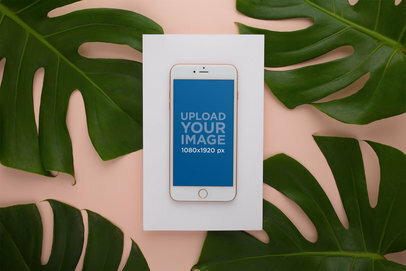 A white piece of cardboard is centered among a light peach color background and holds an iPhone 8 with the screen facing up. 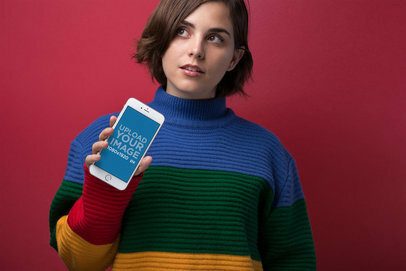 A young woman with short, brunette hair and brown eyes holding an iPhone 8 in her right-hand looks away from the camera towards her right. The woman is also wearing a sweater with the colors of blue at the top, green in the center, yellow near the bottom, and red on the wrists portion. The woman stands against a wall that has a red background. 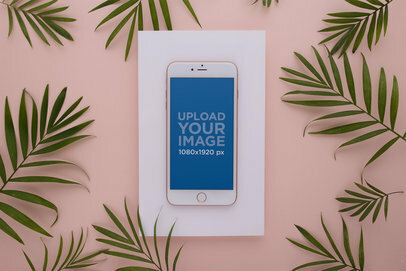 An iPhone 8 lays on a white sheet of paper. There are daisy flowers next to the smartphone, specifically on the right side of the phone. The iPhone 8 has pink edges and a white faceplate. It has a home button at the bottom center and a camera at the top center of the phone. 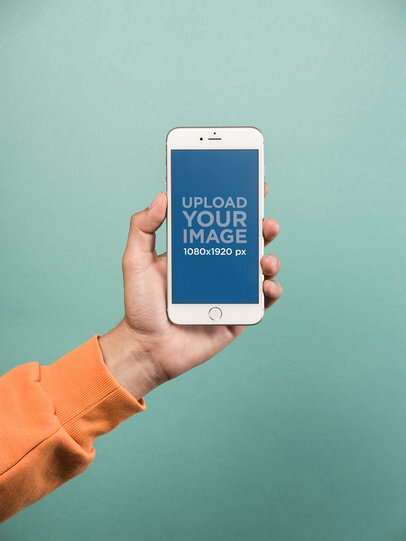 An iPhone is being shown here on top of a rectangular surface. It is an iPhone 8 Plus and it has a white bezel. You can tell that the other side of the iPhone is Gold. 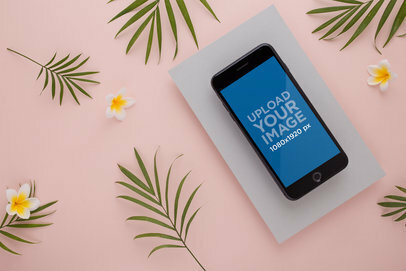 The background shows some green plants around the iPhone. The color of the background is pink as well but a light shade of pink. The screen of the iPhone is blue with some words on it. 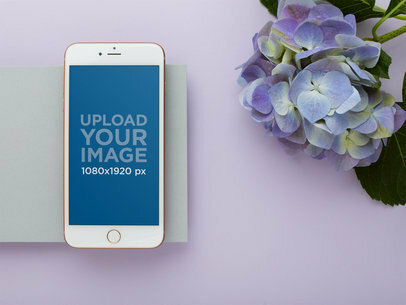 A gold iPhone 8 rests on a white piece of paper that is sitting on a pink table. On the table around the iPhone, there are green live branches that are from ferns that frame in the iPhone. 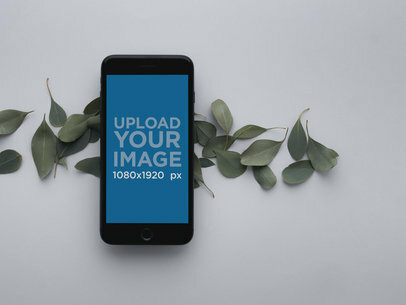 An iPhone 8 with a screen displaying the words "upload your image." 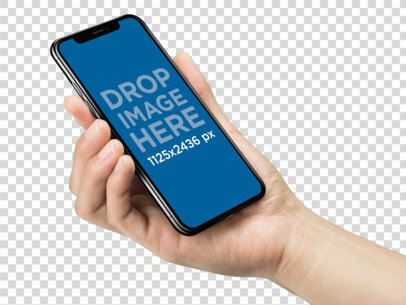 The phone is shown in a plain white area. Outside of the white area are large green leaves resting on a beige surface. 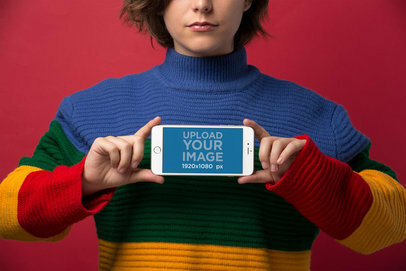 A woman is standing, holding up a Silver iPhone 8 Plus in front of her. She is wearing a colorful turtleneck. Her turtleneck is yellow, red, green, and blue. She has short brunette hair that goes down to her neck. She is raising her eyebrows and wearing light lipstick. She has a clear complexion and has a content look on her face. 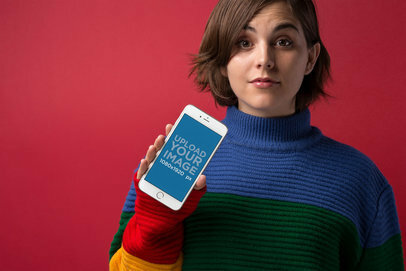 A woman with the lower half of her face only visible is holding an iPhone 8 Plus in landscape position with the screen facing towards the camera. She is standing in front of a red background. She is wearing a multi-colored sweater with red, yellow, green and blue stripes. Her brown hair is chin length and she looks like she is on the brink of a smile. A Space Gray iPhone is centered in the image with a gray backdrop. It is placed on dark green leaves and stems. There are also stems and berries around it. 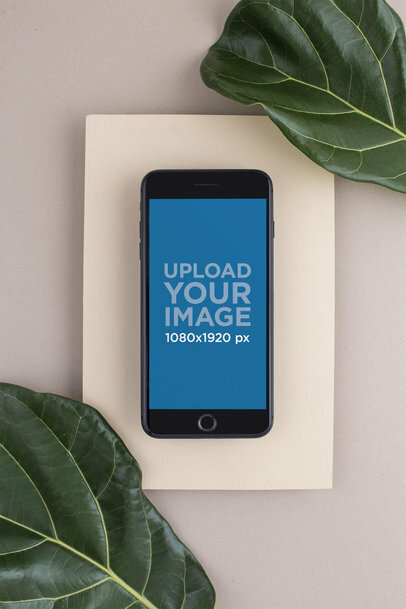 The phone screen is blue and says "Upload Your Image" it also includes a pixel dimension on it. 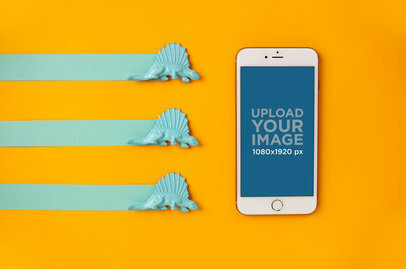 A watermark is visible on the image, and it says Placeit in gray and white. 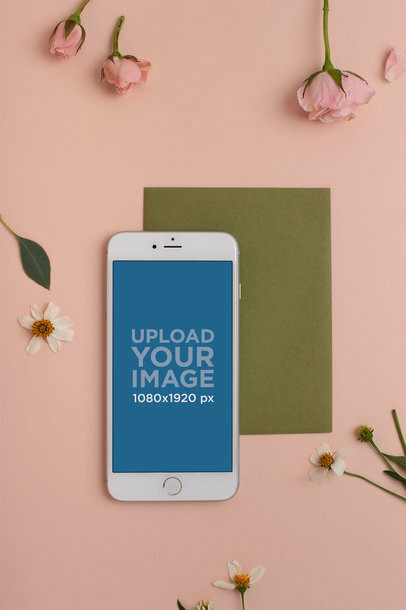 An iPhone 8 Plus is displaying the image resolution of the phone, 1080 X 1920 px. 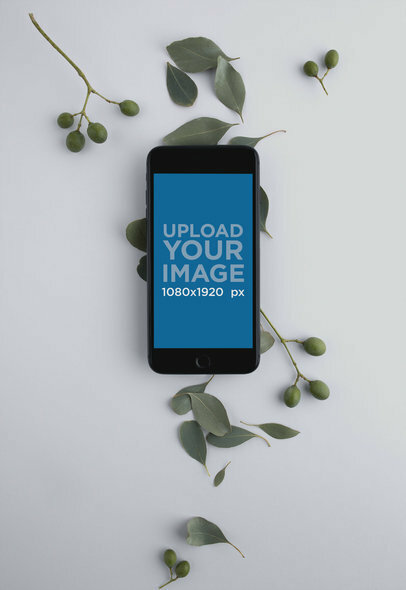 The phone is centered in the image and is surrounded by a white background. A pink background covers the outer half of the photo. The pink background also features flowers and petals are covering it. A silver iPhone lays on a surface that is pink and is also partly lying on a small olive green sheet of paper. There are flowers surrounding it which consist of tulips and daisies that are pink and white. 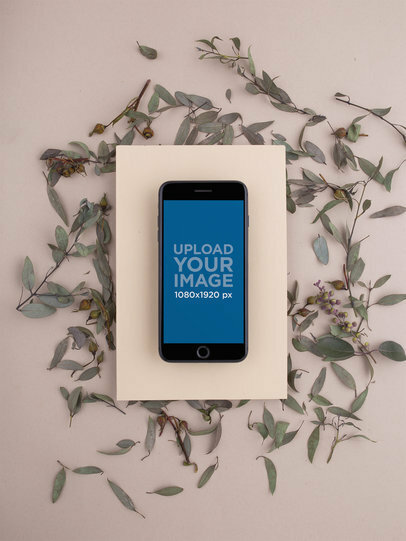 The screen of the iPhone is asking the user to upload an image. 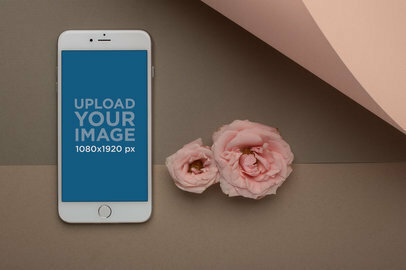 The image displays a Gold iPhone 8 with pink roses next to it. 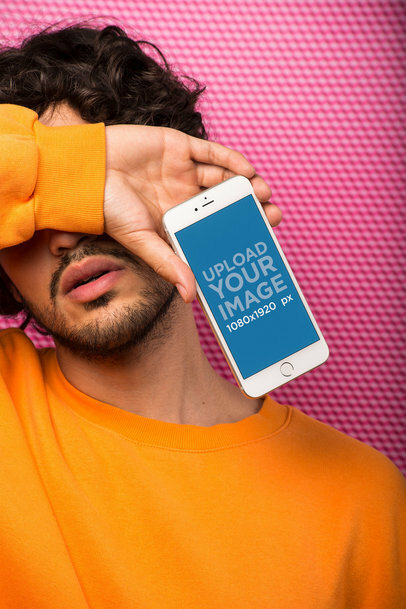 The iPhone's screen has the words "upload your image." 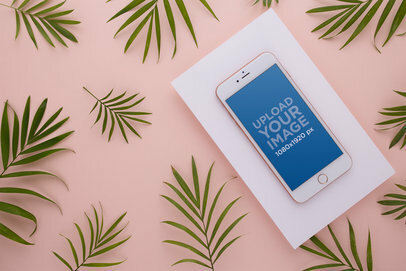 Behind the iPhone, there is a green rectangular paper and green leaves. 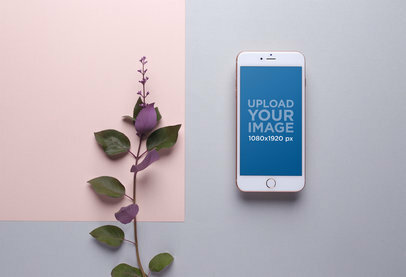 An iPhone 8 Plus rests against a light violet-colored background. It is placed somewhat to the right of the center of the image. Forty percent of the left side of the image is a pink rectangular background. The pink extends from the upper left corner but does not entirely reach the bottom left. A long flower rises up from the bottom left. It has green and dark violet leaves. Centered in the middle of an orange-yellow background is an iPhone 8 Plus positioned vertically. There are two orange rectangles in the image. One of them is to the left of the phone and the other is in the top right corner of the image. A large and small white circle sit to the lower left side of the phone. A pink paper sits on top of a white paper on the bottom right corner of the image. A Space Gray iPhone 8 Plus lays flat. It is on top of leaves that are scattered in a horizontal line. There are about 20 leaves in the row behind the phone. The background is grey, the leaves are bright green, and the phone is Space Grey. 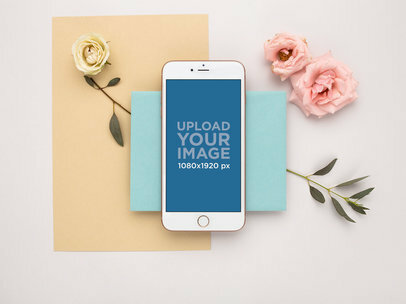 A rose gold iPhone 8 with white glass around the screen while sitting on a green table that also has yellow stripes on the table. The yellow stripes are at an angle from the top left corner and are pointing to the left side of the phone. A Space Gray iPhone 8 Plus is standing straight up. 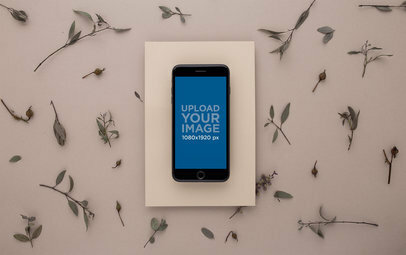 The iPhone has a background showing its resolution and an "upload your image here" text. There are leaves on the ground below the iPhone. An iPhone Plus 8 sits against a golden yellow background. 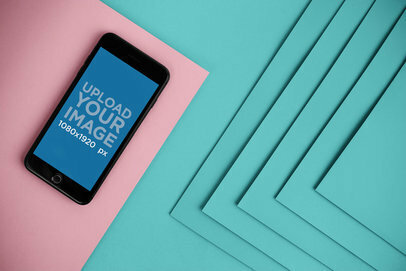 The iPhone is on the right side of the image. On the left side, there are three green toy dinosaurs. They are aligned vertically. Each dinosaur has a thick green stripe trailing behind it all the way to the edge of the image. The dinosaur is crawling on all four legs and has an arcing, fin-like back. We see the hand of a light skin man holding a Silver iPhone 8. 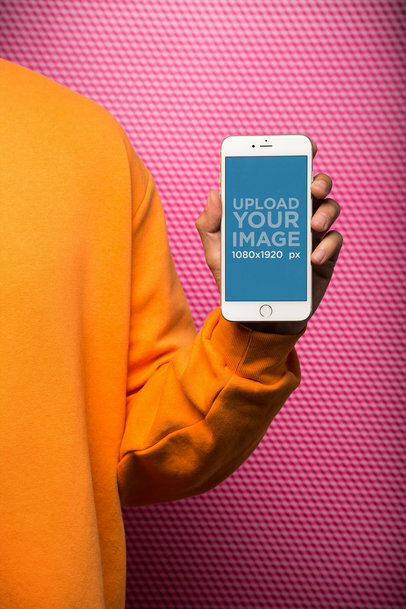 The person holding the iPhone is wearing an orange sweatshirt. 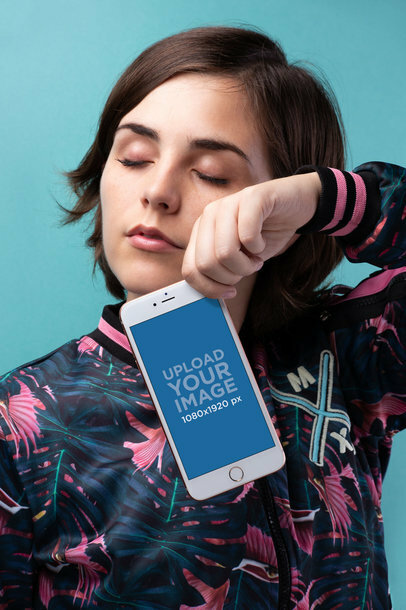 The screen of the iPhone is facing forward, and only the left half of the man is visible. A Silver iPhone 8 Plus is being held by a hand. The smartphone has a blue background. The arm is covered with an high-contrast orange sweatshirt. 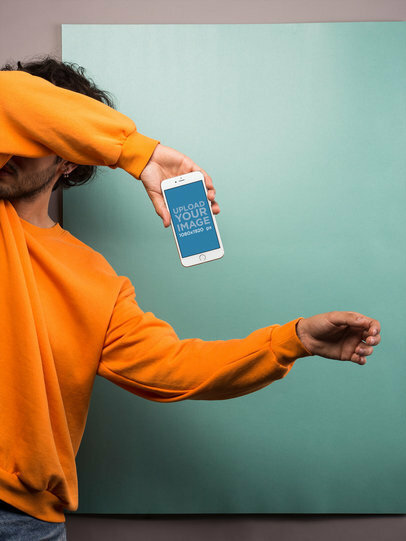 A man is covering his eyes with his arm while holding an iPhone. He has one of his arms by his side while the other arm is holding an iPhone as it covers his eyes. He has curly and brown hair. He also has on a bright orange shirt as well. The phone that he is holding is a Silver iPhone 8 Plus and has a white bezel. The background is pink and white patterned checkers. A Caucasian man with a beard, black hair, and an earring in his ear is holding an iPhone in a landscape position. The man is wearing an orange sweater and he is semi-covering his face with his arm. His eyes are closed and he is looking towards the ground. 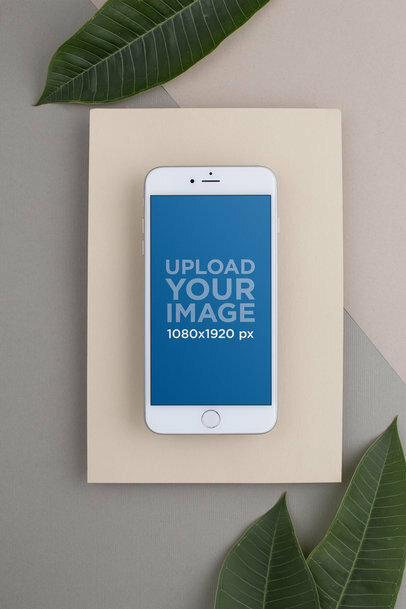 The iPhone tells the user to upload an image with a 1920x1080 px resolution. 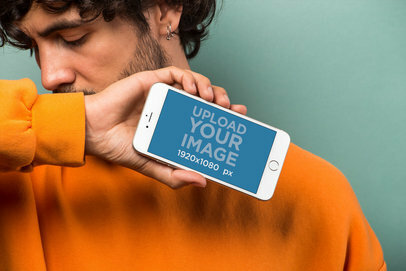 A man is holding a Silver iPhone 8 Plus off to the left side of his body. He is wearing an orange sweater and holding both arms out to the left. He has a scruffy beard and shaggy black hair. He is standing in front of a turquoise piece of art that is hanging on a grey wall. He appears to be acting whimsically and is wearing jeans. A Silver iPhone 8 lies on a plain piece of paper. 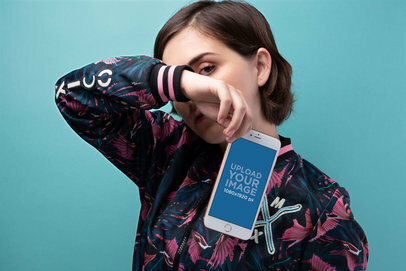 It has a large screen with the words "Upload your image." 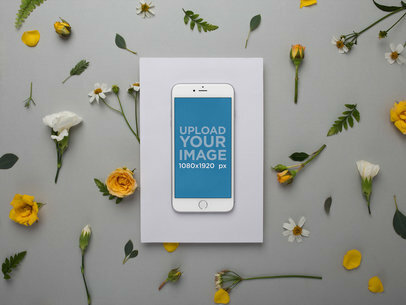 The iPhone is surrounded by a pattern of white and yellow flowers, some fresh cut, and some blooms. Among the flowers, there are scattered leaves of various shapes and sizes. 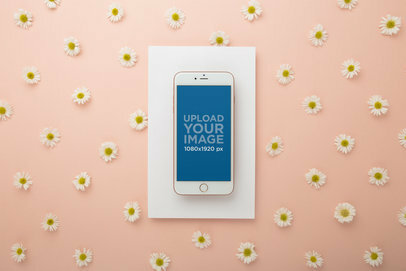 A scattering of yellow and white flowers are decorated around an iPhone. The phone is matted and in the center of these flowers. It makes the phone look beautiful and organic. 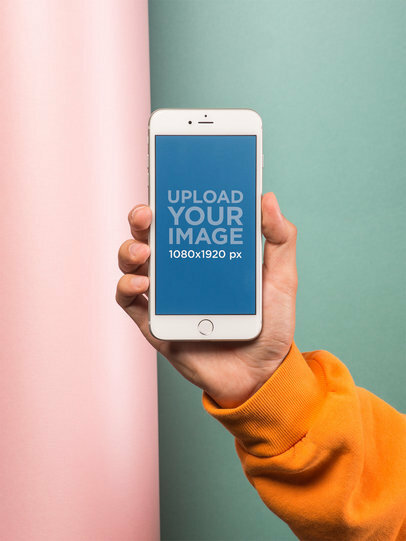 A hand is shown holding an iPhone 8 with the text "UPLOAD YOUR IMAGE 1080x1920 px" displayed. 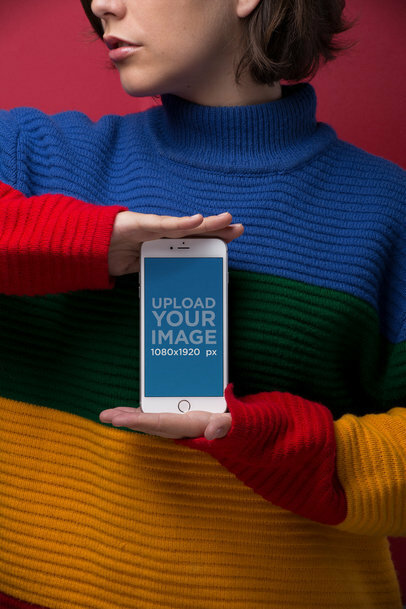 Only the arm and hand of the iPhone holder is shown, and the person is wearing a sweater. 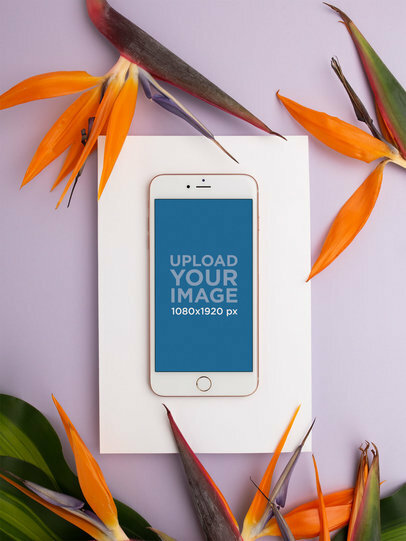 A sleek iPhone 8 Plus is featured in the image. The home button is located at the bottom of the phone, equidistant from each curved side of the device. The screen itself has a rectangular design, it being shorter in width than how expansive it is in its length. The camera and the speaker of the iPhone 8 Plus are located right near each other, above the screen at the top of the phone. Different colored roses adorn a light brown background spread out in equal spacing. There is a piece of cardboard that sits above some of the roses which carries a Silver iPhone. 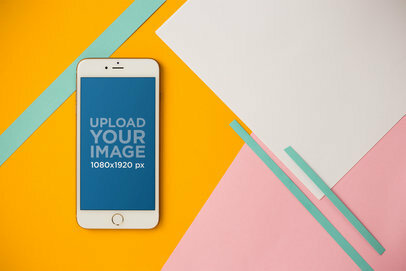 An iPhone 8 Plus sits against a colorful geometric background. The iPhone is on the left side of the image. Much of the left side background is orange, but there is a light green stripe cutting through the upper left corner. There are two parallel thinner stripes in the bottom right corner facing perpendicular to the other stripe. The rest of the right side has paper sheets with two different shades of pink. A Space Gray iPhone 8 lies facing up on a piece of colored paper. Next to the iPhone are four more pieces of paper of a different color. The paper sheets are stacked on top of each other in a cascading arrangement each one evenly spaced on top of the next. The image is highly geometric and measured. The photo has 8 fully bloomed pink carnation flowers spread out. Leaves and other partially bloomed buds are also placed throughout. 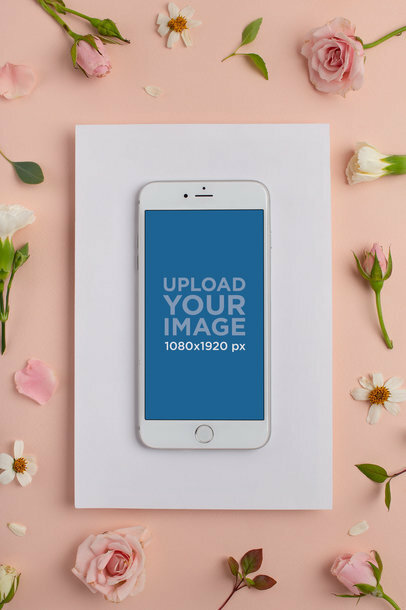 On the right-hand side of the image, there is an iPhone 8 placed among the flowers. Nothing is touching the iPhone, and it is slightly off center. The iPhone is clearly the main item in the image. 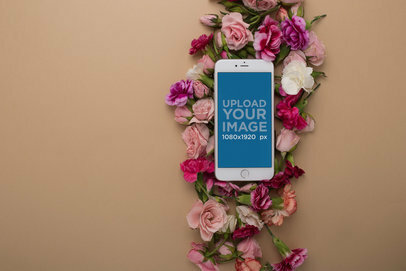 An iPhone 8 is lying on a bed of flowers. Those flowers mainly consist of roses and carnations in different pink tones. 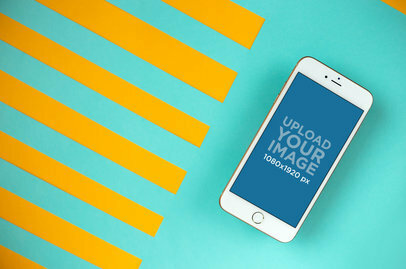 The screen of the iPhone is asking the user to upload an image. 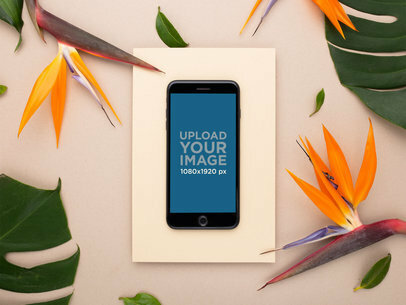 The flowers and the iPhone are resting on a flat surface that is tan in color. 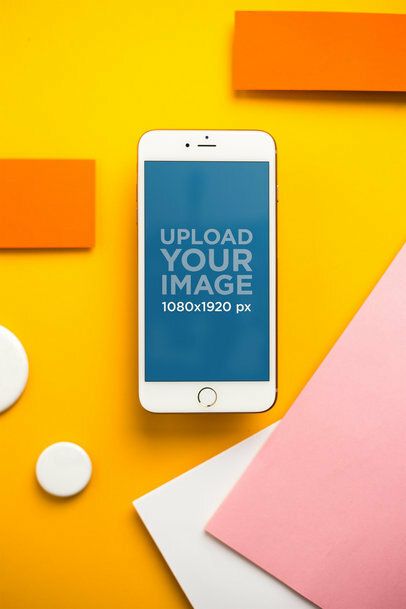 This picture displays a Gold iPhone 8 Plus that is lying on a two-color geometric background. 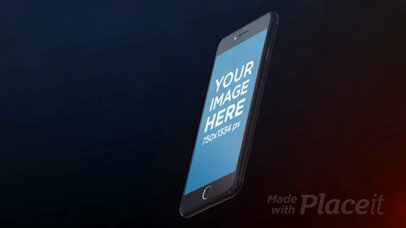 On the front of the iPhone, there is a text explaining the resolution of the screen; this image can be edited. The background has 3 paper sheets over a horizontal stripe. The entire image has a watermark that says Placeit. 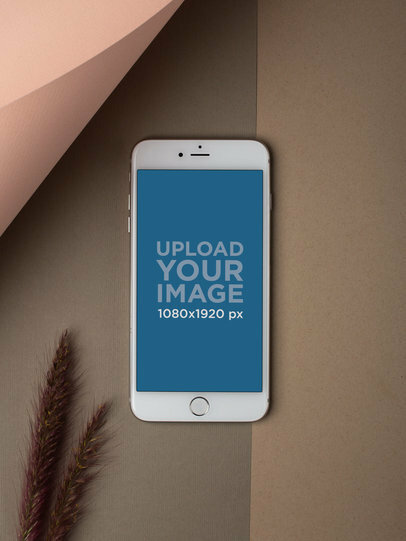 A white smartphone displaying a screen that says "Upload your image 1080x1920 px" is laying on a white square. Surrounding the smartphone is an array of paradise flowers in a striking orange color. The flowers are nestled in a wrapping of verdant green leaves. 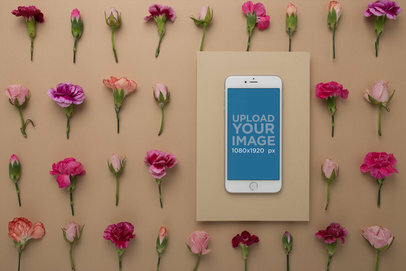 Behind the flowers, the smartphone and the white cutout, the background is a calming shade of lavender. 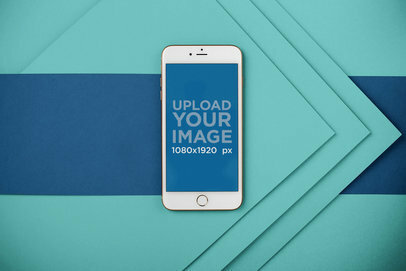 A Gold iPhone 8 Plus is positioned vertically on a solid backdrop, to the left of center. In the center is located 2 pale pink roses. One rose is twice the size of the other rose. 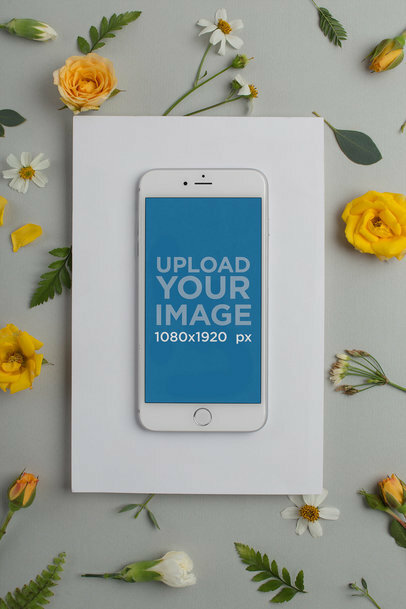 A solid image in the upper right corner looks to be a piece of paper pulled back to reveal the iPhone 8 and roses underneath.